The easy way to fix peer review: Require submitters to review first. Peer review is slow. It’s unhelpful. It’s generally awful. Here’s how to fix it. I’m sure you’ve heard the adage “publish or perish.” In order to get tenure—or, as the abysmal job market begets hyper-professionalization, to be considered for a job at all—a scholar must have a certain amount of articles appear in “peer-reviewed” academic journals. These journals—Obscure Subfield Quarterly, One-Word Pretentious Greek Thing, etc.—usually have a circulation of about 300. Their subscriptions cost hundreds—if not thousands—of dollars per year. Thus, they remain all but inaccessible to someone without research-university affiliation. Thus those articles upon which careers depend are usually read by exactly three people. I’m not even going to get in to the particulars of why this intentionally restricted readership helps no one (except the occasional for-profit publishing conglomerate)—because that’s not even the worst thing about academic publishing. The worst thing about academic publishing is two-thirds of a given article’s three-person audience: The “referees,” or “peer reviewers,” to whom the editor sends the piece for vetting. Think of your meanest high school mean girl at her most gleefully, underminingly vicious. Now give her a doctorate in your discipline, and a modicum of power over your future. That’s peer review. Should all academic articles just be accepted with a hug and a cookie? Of course not. A thorough vetting of a new piece of scholarship is indeed crucial—but right now, rather than being constructively critical, far too many peer reviews are just cruel for no reason (or, apparently, fraudulent!). But some articles are just bad! whine the meanies, in a panic that they’ll lose their only consequence-free opportunity to express their professional misery. And yet, you can reject an article without stating, definitively, that its author has no business in the profession. I’ve done it. It’s not even the slightest bit difficult. @pankisseskafka For a paper about media coverage of terrorism one of my reviewers said too many of my sources were journalistic. @pankisseskafka not mine, but a friend who waited over a year, article got rejected after she followed up, was covered in footprints.
.@pankisseskafka Reviewer A: Not enough of my work here. Reviewer B: Not enough of my views here. Reviewer C: What *I* would have said is. So many readers’ reports can be boiled down to: “Why wasn’t this article exactly the one I would have written?” (Or: “Why wasn’t I cited enough?”) Thus, too often, academic peer review is gatekeeping for its own sake, whose chief result is to wound the author as deeply and existentially as possible. For scholarly articles are exacting, they’re difficult, and they are often an expression of one’s full academic self. They can take months—sometimes years—to write. 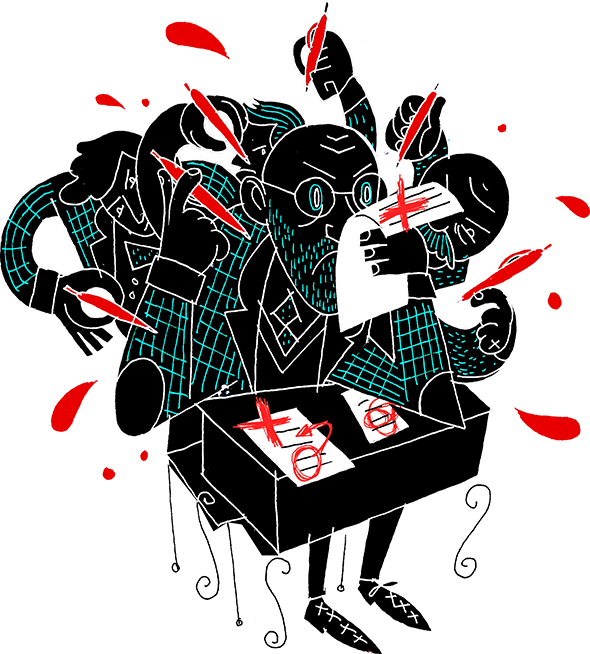 They’re our guts, spilled onto the paper, the absolute best work we can possibly do. Peer reviewers know this—they write articles themselves—and yet they still seize it as a rare opportunity to kick down. Aside, however, from imploring academics not to be jerks (a likely futile task), the usual fixes suggested (and, sometimes, implemented), aren’t bad—but they could be better. Some academics argue, for example, that if reviewers signed their names, they might think twice about their pettiest jabs. I’m not so sure, though. Anyone who’s sat through the Q&A after a conference presentation knows that a lot of academics consider it sporting to rip each other’s faces off in public (“I don’t have a question so much as a comment”; a 20-minute tirade ensues). Another solution is the idea of open-source peer review, of the sort scholar Kathleen Fitzpatrick recently accomplished with her book Planned Obsolescence: Publishing, Technology and the Future of the Academy. The 43 peer reviewers she crowdsourced online, Fitzpatrick tells me, came from a diverse variety of disciplines, and thus “often disagreed with one another, and their discussions gave me important information about ways my work was being interpreted.” This, she said, combined with the two traditional reviews from her publisher (which she also says were quite constructive), improved her book drastically. I’m glad this system worked for her, but I admire her fortitude—because when I read “crowdsourced peer review,” I hear “Internet comments,” and I want to crawl into a hole and die. What we need is an idea that takes advantage of, rather than battles against, academics’ petty self-interest. Luckily, the peers who review your work may think of themselves as above you in every way—but there’s one important manner in which they’re not: They need to publish too.